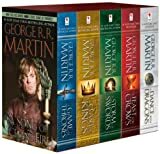 Excellent read, may start slow as any series does but once the ball rolls it doesnt stop, had a hard time putting these books away until I finished all 6. Absolutely loved this one. Had a hard time putting it down. Great story and characters. I want him to write more!